While at Walt Disney World, one can actually feel like they are stepping back in time as soon as they emerge from underneath the tunnel of the Magic Kingdom railroad station. You immediately enter a magical Main Street complete with a fire station, city hall, shops, restaurants, and even a beautiful theater. Take this fun quiz to test your knowledge of Walt Disney World’s Main Street USA. What is the name of the WDW Main Street USA restaurant where you can get a foot-long hot dog, while enjoying a live piano player tickling the ivories to classic ragtime tunes? What is the name of the group of fun and colorful characters that you can interact with while on WDW’s Main Street USA? 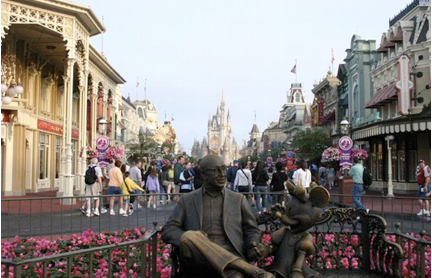 What is the name of the coffee shop located on WDW’s Main Street USA which serves Starbucks brand coffees & treats? Where would you find a delicious breakfast of Mickey Mouse Waffles while on Main Street USA in the Magic Kingdom? If you hopped on the Walt Disney World Railroad at the Main Street USA station, how long would it take for a full round trip around the Magic Kingdom Park? Quiz: WDW Monorail Resorts – How Well Do You Know Them? This quiz was very simple, it’s like walking right down the middle of Main Street U.S.A. I really liked this one! It was like just picturing Main Street. Really brought me back! Fun one! I think I’ll go play Main Street music on the jukebox now!